Improvements in design, equipment and materials meant that corsets could mould the figure to suit the latest fashions. 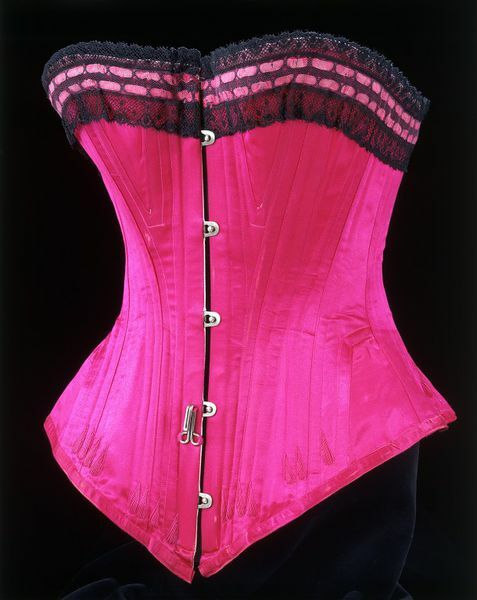 The straight busk on this corset creates a vertical line from bust to abdomen which complemented the less rounded, more angular silhouette of the 1890s. It was also supposed to relieve pressure on the internal organs while supporting the stomach. Shaped pieces (five on each side) have been seamed together and bust and hip gussets inserted to give the corset its distinctive shape. Strips of whalebone follow the contours of the hourglass silhouette, creating a rigid structure to emphasise the smallness of the waist. Each strip is enclosed in a bone channel formed by neat rows of machine stitching. The decorative embroidery stitches (flossing) visible towards the bottom and back of the corset prevent the whalebone from forcing its way out of these channels. A hook is attached at the centre front to prevent the petticoat from riding up and causing extra bulk at the waist. Corset made of pink satin trimmed with black machine-made lace through which is threaded with a dark pink satin ribbon. The corset is a short hip length dipping to a point over the stomach in front. It fastens with loops and studs in the centre front, and has an eyelet and matching cord adjustment at the centre back. There are bust and hip gores, and the corset is medium boned. It is machine-stitched, bright pink edged and hand-flossing, with metal slot-and-stud fastenings.